I’m not a gourmet chef, by any means—that’s what Ernesto is for—but I do like to dabble in the kitchen from time to time. My own repertoire is somewhat limited—there’s only so much one can do with a kitchen tucked in a volcanic lair, even if it is spacious and well-heated. I like to make a little stir-fry, occasionally cook up some fish, maybe even the occasional box of non-instant oatmeal. Daring choices all, I know. But, more importantly, what’s the point in having a kitchen if you can’t stock it with the latest in culinary gadgets? Here’s a trifecta of kitchen-based tech for you this week: self-sufficient salt and pepper shakers, a toaster oven that lives up to its name, and the only kitchen knife you’ll ever need. If you thought the human race couldn’t get any lazier, allow me to provide evidence to the contrary. I can think of few tasks less intensive than salting and/or peppering ones own food, but apparently there are people for whom that constitutes cruel and unusual punishment. For those people, we offer forth the Movers & Shakers. Available in your choice of Oyster White and Charcoal, Warm Red and Nectarine, or Cornflower Blue and Creamy Yellow, the Movers & Shakers may look like ordinary salt shakers, but they conceal a terrifying secret. Pull the cord attached to the shaker, turn it upside down, and it will shake itself. 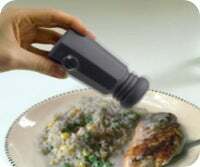 That’s right: self-shaking salt and pepper shakers. It makes sense, when you think about it: when the robots rise to destroy us, if we can’t even shake our own salt, what chance will we have of fending off those diabolical machines? The retail price of these shakers may only be $10.50 for a pair, but the cost is our very future. The choice is yours. For too long, many of those who’ve been on a squeeze in kitchen space and budget have opted for that most bastardized of appliances: the toaster oven. But if there’s one thing that I’ve learned over the lifespan of my many lairs, it’s that the toaster oven is unfit as both oven and toaster. Of course, these suckers will work as ovens too, should you need to say, broil or bake something, as I hear some on occasion do. In addition, they sport a slide out track with drip tray, easy crumb removal, and fifteen minute timers. Your only choice now is whether to go with the white, black, or stainless steel model. Prices range from $45 to $70 at Amazon. Cutlery is a key tool in much of food preparation, and the consummate chef knows that different knives are best suited for different tasks; length, weight, serration, and more all play a part in determining which knife to use. But what if you could get away with using just one instrument for all of your kitchen needs. That’s where the $99 Build Your Own Lightsaber Kit comes in. Wait, wait—hear me out. We’re talking a lightsaber here—it cuts through anything. No more worrying about whether you need a bread knife, a cleaver, or a utility blade. It cuts through meat, vegetables, and butter like, well, butter. Best of all, this kit lets you can customize the lightsaber to your liking: color, decoration, and more. Plus, in case you ever find your kitchen besieged by Imperial stormtroopers and Dark Jedi, you’re all set. Man, $99 for a lightsaber is a steal. I need to go pick up one of these—wait, hold on, replica? Crap. All this talk of kitchen gadgets makes me want to prepare something splendid for dinner. Sadly, the grocery shopping around a remote volcanic hideout is limited to say the best. At least Domino's delivers. See you next week.